The Celtics selected Jayson Tatum with the third pick in the 2017 NBA Draft. The Celtics rookie wanted a better life, so he and his mother made one. Now he’s on the threshold of NBA stardom. Brandy Cole tried to shield her only child from the struggles that filled their small brick home on the west side of St. Louis, but it was not easy. 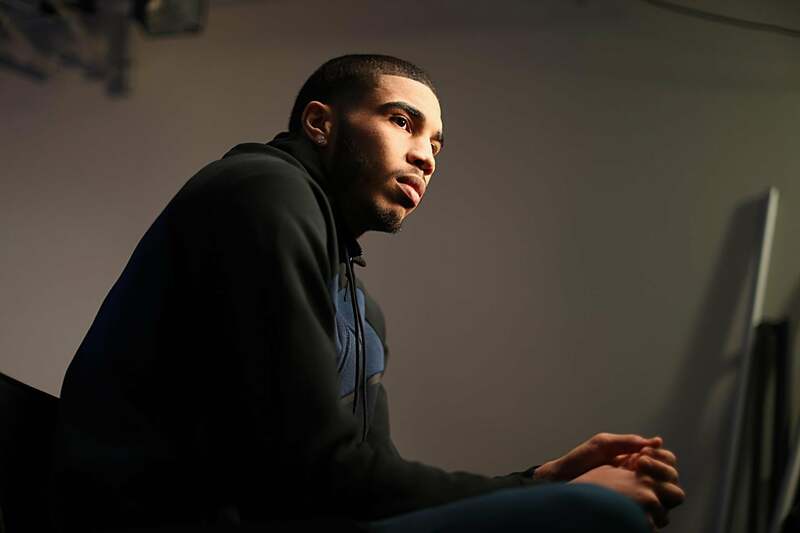 Sometimes young Jayson Tatum would find that the gas had been cut off because of unpaid bills, so his mother would turn on the clothes dryer for heat, or warm water on a stovetop for baths. On cold nights, she would plug in a small space heater in her bedroom and hold her son close. When the electricity went out in the evening, she sometimes turned on her car’s headlights so Jayson could at least play on an illuminated basketball court. The most humbling moments came when food was scarce. Brandy, who had Jayson when she was a freshman in college, sometimes baby-sat for a neighbor and received dinners in return. Jayson would knock on the door when it was time to eat, and the family would usually give him a frozen chicken pot pie to bring home. His mother would tell him to eat the filling and leave just the crust for her. As Tatum completed this thought last month, he sat on an elegant lounge chair in the lobby of the five-star Hotel Grand America in Salt Lake City. The NBA rookie was in the midst of a road trip with the Boston Celtics, and his better life had arrived. Tatum is sitting pretty now, but it wasn’t always that way. The Celtics are paying him $5.4 million this season, and the 6-foot-8-inch forward has already emerged as one of the league’s most scintillating young talents. When he was a child, he looked forward to nights when his mother had saved enough money for a pizza from Imo’s, a St. Louis chain. Now, he is the company’s spokesman. The Celtics are reluctant to heap praise on a 20-year-old, but within the organization, there is measured optimism that he could turn into the franchise’s next superstar. Tatum is not overwhelmed by that possibility, though, because he has been charging toward it from the start. Justin Tatum was 16 years old when he noticed a girl working at a candy store in a St. Louis mall. The two started flirting and then started dating, and when they were freshmen at separate colleges in the city, they had a baby named Jayson. 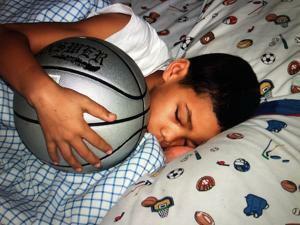 The boy’s love for basketball was instantly obvious. His father played for St. Louis University, and as a toddler, Jayson would scurry onto the court at halftime and find the nearest ball. At home, everything became a hoop — trash cans, laundry baskets, the grocery bags that his grandparents held for him to aim at. When Jayson was 3, he joined a YMCA league for 5-year-olds. As he sprouted, other parents thought he was too old for whatever league he was in, and Brandy would sigh and present a birth certificate that showed he was actually too young. Tatum viewed the game through a unique prism. When his teachers were preoccupied, he’d sit in class and study YouTube clips of the game’s greats. Then he would go home, drag a hoop onto the street, place two bricks on its base, and try to master the moves himself. When he played basketball video games, he even tried to set screens and draw up plays. “He just kept training his mind,” Justin Tatum said. Tatum’s love for basketball was apparent from the time he was a tot. Jayson was excellent at everything except losing. Youth-league defeats crushed him to the point that teammates would go to his house afterward to check on him. When Tatum was 8, his father returned from a brief, injury-plagued pro basketball career in Holland to focus on training his son. Justin Tatum worked as a substitute teacher and eventually became the varsity basketball coach at Soldan High. Jayson started practicing with that team when he was just 9 years old. When Tatum was a child, Brandy would bring him to her college classes during the day, and then have a friend or family member watch him while she worked at a Cingular Wireless store at night. She picked up shifts no one wanted, because it was easier to collect commission sales that way. Brandy and Justin had a complicated, off-and-on relationship. Justin consistently sent money, and saw or spoke to his son almost every day, but there were still financial challenges. The utilities at Brandy’s home were routinely cut off. The refrigerator was not always stocked. One day, Brandy found an eviction notice taped to the front door. Jayson didn’t understand, but he knew from his mother’s tears that it wasn’t good. A family friend ultimately helped pay off part of the mortgage, and Brandy kept the home. But she would not let these setbacks derail Jayson’s goals. 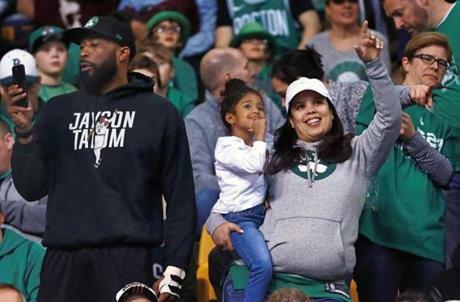 Tatum’s mother, Brandy Cole (right), attended Game 1 against the Bucks at TD Garden. She is holding Tatum’s half-sister, Kayden Tatum. At left is Jayson’s father, Justin Tatum. Brandy had played volleyball at University City High in St. Louis, where she was coached by Besta Beal, whose son, Bradley, would become an NBA All-Star. Brandy sometimes baby-sat Bradley, and the two families became close. When Jayson was in seventh grade at Chaminade Prep and Beal was a senior, they trained together after school, and Beal would drive Tatum home when they finished. Beal’s trainer, Drew Hanlen, refused for two years to start working with Tatum, because he was simply too young. Finally, when Tatum was a high school freshman and Beal was preparing for his rookie year with the Washington Wizards, Beal made one more pitch. Beal brought Tatum to a workout with Hanlen, and the youngster nearly passed out after 20 minutes. But he came back the next day, and the next. Hanlen crafted an arsenal for Tatum by plucking other stars’ powers: Kobe Bryant’s fadeaway jumper and jab step, Paul George’s floater, Kawhi Leonard’s defense. Every month or so, Hanlen would send a text message to Celtics director of scouting Dave Lewin, telling him that he was training the future No. 1 overall pick. Lewin told Hanlen the Celtics liked Tatum, but there was no way for any of them to envision what would come. By his junior year at Chaminade, Tatum had become a superstar. He had a key to the gym and would arrive by himself for 6 a.m. workouts. His games were moved to college arenas to accommodate the swelling crowds, and fans lined up hours in advance. There was even a ticket resale market. Tatum’s other grandmother, Kristie Jursch, used to arrive four hours before tipoff with a pile of long silk scarves that she would use as space savers for family. It was quite a production. Despite the fuss made over him, Tatum was not cocky or brash. His classmates found him quite shy, but it could be dangerous for opponents to be lulled by his demeanor. Five years after Beal was named Gatorade National Player of the Year, Tatum received the same honor at the same school. St. Louis improbably had become the epicenter of high school basketball. 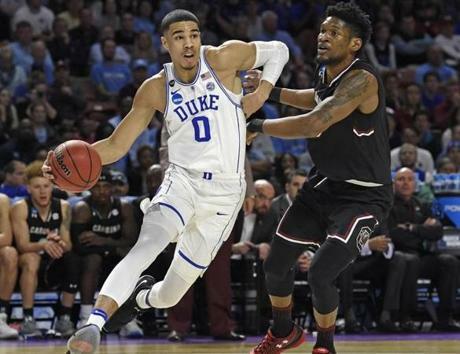 In April 2015, just a few days after Duke won a national title, coach Mike Krzyzewski was scheduled to fly to St. Louis to meet with Tatum and his family on a recruiting visit. But massive storms were pushing through the area, and the pilot of Krzyzewski’s private jet was hesitant about the trip. Tatum’s mother urged them to reschedule. “I was like, ‘I cannot have Coach K dying on his visit to see us,’ ” she said. But Krzyzewski wanted Tatum, who was just a junior, to know how important he was to Duke’s plans, so he came anyway. By the end of the visit, as Krzyzewski played with Tatum’s 90-pound boxer, Lenox, Tatum was sold. He told Krzyzewski he would become a Blue Devil, and the coach started to cry. In his one season at Duke, Tatum averaged 16.8 points and 7.3 rebounds per game. On Oct. 25, 2016, Tatum sprained his foot during Duke’s pro day, an annual showcase held for NBA scouts and executives. He missed the season’s first eight games and was rusty when he returned. After bad outings, he would go back to his dorm and inspect every online NBA mock draft he could find. NBA decision-makers were never really alarmed, however. They saw Tatum’s length and athleticism and poetic jump shot. On Dec. 6, Celtics coach Brad Stevens was in Orlando for a game against the Magic when he and his wife, Tracy, watched on television as Duke played Florida. Last June, Tatum held individual draft workouts in Los Angeles for the Celtics, 76ers, and Suns, who had the first, third, and fourth picks, respectively. He went into the Boston session thinking it was pointless. Despite his lack of interest, Tatum put on a show for Boston’s brass, splashing one 3-pointer after another. The Celtics generally do not care much about shooting displays that don’t involve defenders, but they had been watching Tatum for years, and they were smitten. Tatum said that after his workout for Philadelphia, the 76ers told him they intended to select him with the third pick. He flew to Phoenix anyway to meet with the Suns, and he was enchanted by the warm weather and easygoing lifestyle. Maybe Phoenix was where he belonged, he thought. But while he was there, Krzyzewski called. Tatum was exhausted from the process. He didn’t want to fly to Boston for a second workout for a trade that might not even happen. But the Celtics were moving quickly. As he reflects on it, the NBA Draft was a hectic, confusing, and exhausting time, but things worked out well. While Tatum was still in Phoenix, he received a call from his agent, Jeff Wechsler. The Celtics were going to trade the No. 1 overall pick to the 76ers for the No. 3 choice and a future first-round choice. Tatum had to visit Boston. The Celtics did not need to see him fire up more 3-pointers. They wanted him to meet Stevens, who had missed the Los Angeles workout because the Celtics season was still going. Tatum was battling a severe sinus infection, and the cross-country flight made him feel worse. He went from Logan Airport to Stevens’s home in Wellesley for dinner. Tracy Stevens cooked steak and chicken, but Tatum had no appetite. He told them he was full, but the truth was that he felt awful. As Tatum sat at dinner, one part of this draft process still had him baffled. He asked Stevens why anybody would ever trade away the No. 1 overall pick. 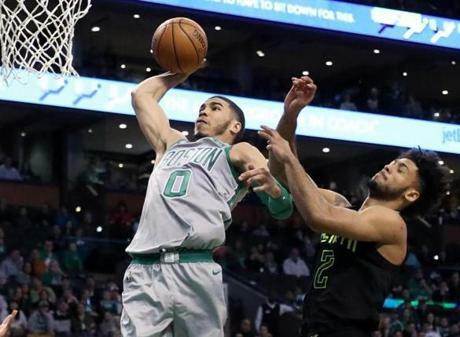 In his rookie season, Tatum quickly blossomed, averaging 13.9 points and 5 rebounds while making 43.4 percent of his 3-pointers. He helped guide Boston to 55 wins despite injuries to stars Gordon Hayward and Kyrie Irving, and he will almost certainly be named to the league’s all-rookie team. But his goals remain considerably grander. It still irks him that he was not the No. 1 overall draft pick. And it irks him that he probably will not be named Rookie of the Year. Tatum has a son of his own now, Jayson Jr., who was born in December. Tatum’s mother and Jayson Jr.’s mother have mostly taken care of the baby through the grind of the NBA season, but Tatum is eager for his first summer with his little boy. Last week he took him to a baby gym class and to swim lessons, and he is already looking forward to the day he can bring him on a basketball court, too. The sky is the limit for this young Celtics standout. For Tatum, despite odds that should have suggested otherwise, the NBA had always been more of an expectation than a dream. Ever since he was in fourth grade, he and his mother had talked about someday living together in whatever city he played in. Now, they both have units in an apartment complex in Waltham, with Tatum living in a second-floor unit and his mother residing two levels above. But Tatum spends most days upstairs anyway. When the Celtics return home from road trips late at night, there is usually a home-cooked meal waiting for Tatum, regardless of the hour. He and his mother talk about the game, and sometimes they talk about how far they have come since living in the small brick house on the west side of St. Louis.